We have just completed our first installation for ETH Enterprise in Malaysia, pictured are Kenny Tok and his works manager Tee alongside their Vanderloo Shuttle Table line which includes in line branding and corner cutting. 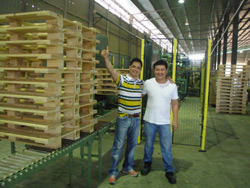 Fishers Latrobe Valley are the first pallet producer in Australia to achieve certification for the manufacture of Euro Pallets. Fridley, MM, USA – Viking Engineering and Development is pleased to announce that it has signed an agreement with MC Technical Services to represent Viking`s line of pallet assembly systems in the EU and the Middle East. “A representation agreement was the next logical step” said Mark Stevens, COO for Viking. “Viking has come to rely on MC Technical Services for installation and repair work in these geographical areas. MC Technical`s ancillary offerings has allowed Viking to extend its reach and provide better services to our customer base”. 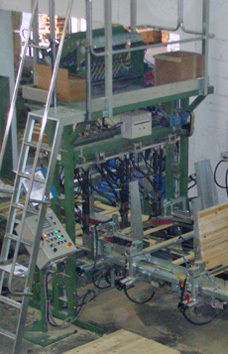 Viking Engineering and Development is the leading manufacturer of pallet assembly systems in the World. With more than 1800 systems in operation in 19 countries around the world, Viking pallet systems are the choice for automated pallet production. Since its founding in 1975, Viking has been dedicated to producing and supporting equipment for the wooden pallet industry.